Truth be told, I approached this anime with a marked skepticism for its contents. I really didn’t believe it could be much more than a childish Bleach ripoff. However, that’s where I was proven wrong. Far from being a Bleach ripoff, or anything of the sort (forgetting similarities like shinigamis, blades with personality, etc), it’s actually a rather thoughtful show with a high budget and great art direction. Even if the plot seems a little bit silly at first, the comedy and characters make up for it (who could possibly not love a scythe/boy who constantly talks like he’s a badass?). In conclusion, you should forgive me for not posting in such a while, especially because I brought you such a nice picture of such a good anime. Watch it! 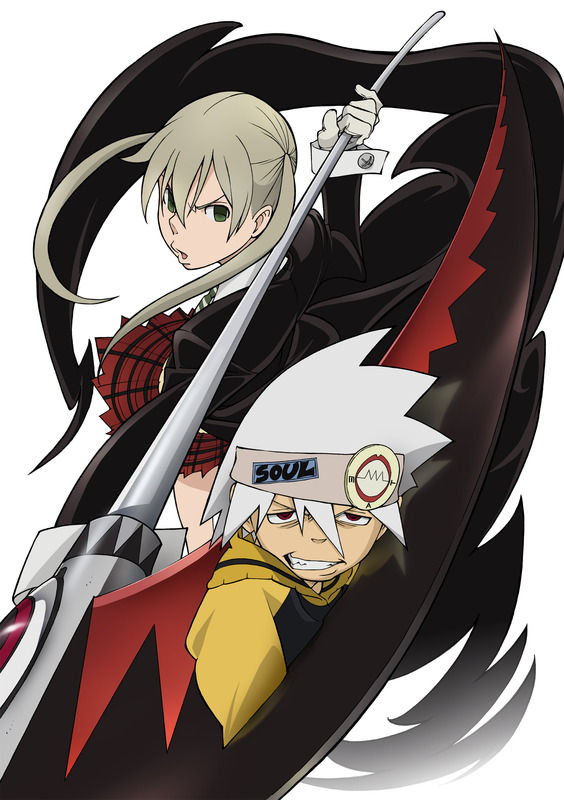 I knew Soul Eater was going to be special from all the hype about it when it first started airing this spring. Once I watched the opening, I knew it was going to be a great shounen. A unique style of animation, opening by TMR – what’s not to like? However, I’ve put it on the back burner for now in favor of catching up on older series. The good thing is, it’s slated to be only 52 eps and not an endless running shounen, which is a reason to pick it up (I like being able to finish things). Maybe I’ll wait till it’s all done, then watch. A note: there are two versions, an uncut/unedited version that airs late at night, and a censored version that airs in primetime. Some groups like Rumbel are subbing both, and some groups aren’t b/c they say the differences aren’t significant enough. Anyways, been thinking about starting it. All those Maka threads on 4chan are getting to me! I got hooked on this anime as soon as I saw it at the showing. I think what got me is the distinct bizzare art style though I hear Gurren Lagaan has the same. Also it doesn’t take itself seriously (at least from the 12 episodes that I’ve seen): just when they hit points where they reach some drama something comedic always comes along to disrupt the mood. If anything it has a catgirl in it <3!